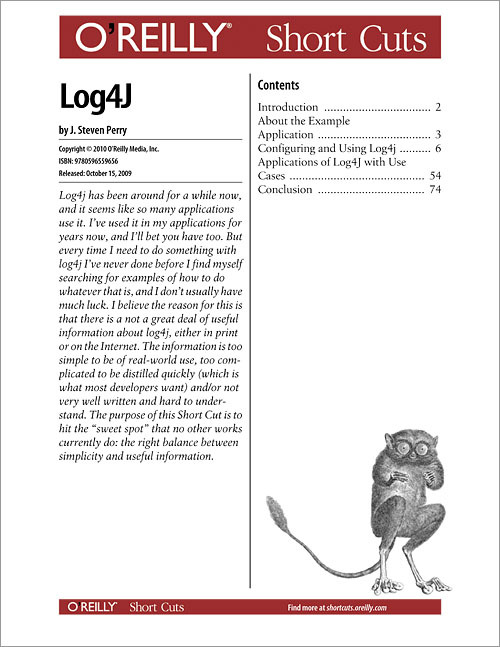 Log4j has been around for a while now, and it seems like so many applications use it. I've used it in my applications for years now, and I'll bet you have too. But every time I need to do something with log4j I've never done before I find myself searching for examples of how to do whatever that is, and I don't usually have much luck. I believe the reason for this is that there is a not a great deal of useful information about log4j, either in print or on the Internet. The information is too simple to be of real-world use, too complicated to be distilled quickly (which is what most developers want) and/or not very well written and hard to understand. The purpose of this Short Cut is to hit the "sweet spot" that no other works currently do: the right balance between simplicity and useful information. The code for this Short Cut is available at the code example repository.